The Timbre Pendant by Tech Lighting showcases modern deconstruction though a minimized structure which emphasizes its beautiful vertical lines of pure light. Each triangular arm can be rotated for precise lighting and dramatic effect. Scaling at three disticnt sizes the Timbre address the need of scale requirements in many spaces. 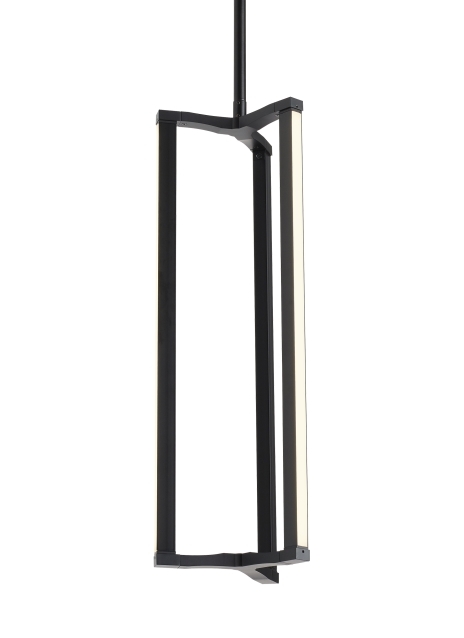 This modern pendant is available in your choice of two on-trend finish options, matt white and matt black. The Timbre can carry into other areas of your space as this collection is available in a linear and wall sconce form. The integrated acrylic-lensed LED lamps are fully dimmable to create the desired ambiance using a low-voltage ELV or Triac dimmer. Includes 32 watt, 2230 delivered lumens, 3000K LED linear modules. Dimmable with most LED compatible ELV and TRIAC dimmers. 277V compatible with 0-10V dimmers. Includes (2) 6" and (4) 12" rigid stems in coordinating finish.